Healthy January stops here as the annual fruit and veg marketing budget runs out. £296.6 million gets spent on confectionery, snacks, fruit, veg and soft drink marketing in the UK each year. But when was the last time you saw a humble carrot ad? That’s because only 5% of that total is allocated to fruit and veg. To highlight the gap in marketing budgets, renowned food campaigner Hugh Fearnley-Whittingstall has joined forces with the national Peas Please initiative, led by Food Cardiff in Wales, to get a new Veg Ad Fund off the ground in order to tempt us into eating our veg. A dedicated Veg Ad Fund, made up of contributions from the Government, retailers and producers would enable vegetables to receive marketing investment that will see veg advertisements compete with branded chocolates, fast food outlets and soft-drink firms. The Peas Please initiative is marking the launch of the campaign for a dedicated Veg Ad Fund by announcing the winner of its vegetable ad competition organised last year. The competition, which asked design agencies and students to design a veg ad for children and young people, received over 60 entries. 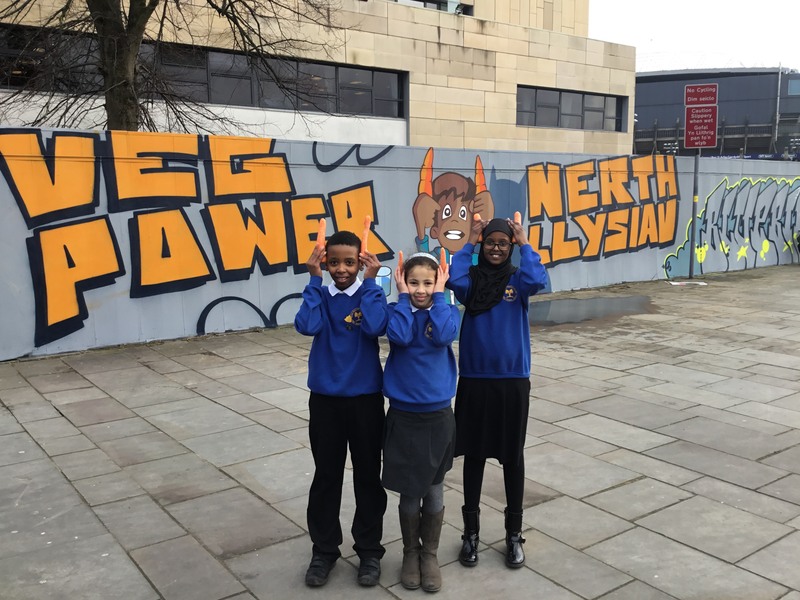 The winner, designed by agency ifour, was chosen by a panel of children from Ninian Park Primary, Cardiff alongside children from England and Scotland as well as advertising legend Sir John Hegarty, from Bartle Bogle Hegarty and Michael Moszynksi from LONDON Advertising. Today, the winning advert will be displayed in over 5,000 locations across Wales and the UK, including all Co-op stores nationwide, museums, local communities and hundreds of primary and secondary school canteens across Wales. 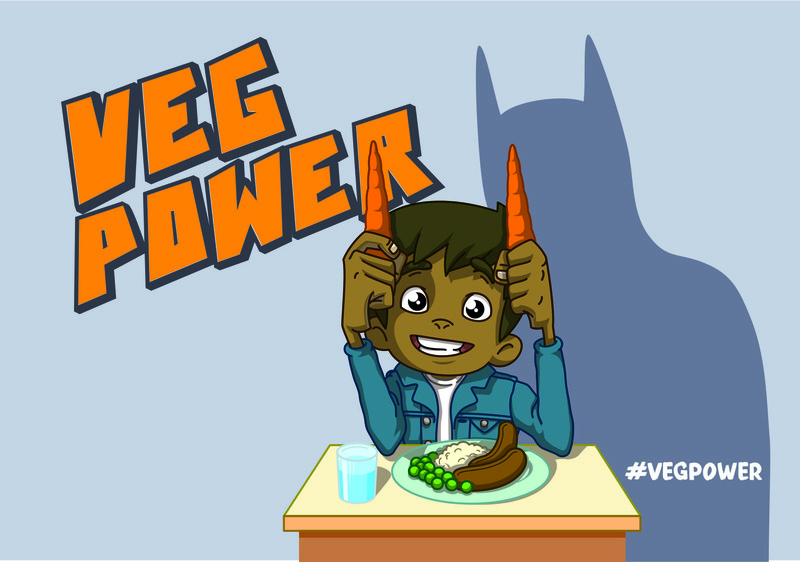 Schools across Wales are also engaging in veg related activities to encourage children to increase their veg consumption. In Cardiff, the poster will be transformed into street art located on Millennium Walk alongside the Principality Stadium. The pupils who were involved in judging the poster were at Millennium Walk to see their winning choice spray painted next to the Principality Stadium. Advertising vegetables is important because 92% of teenagers are already struggling to get their 5-A-Day and low vegetable diets are related 20,000 premature deaths. Research shows that diets high in fruit and veg protect us against coronary heart disease and cancer. Katie Palmer, who leads Food Cardiff said: “This is such a positive campaign and marks the start of a conversation about how we can inspire children to get excited about veg. But to make this work we need buy in from Government, businesses and local communities in Wales to create a fund that can really have an impact on our veg consumption. We urge any organisation that would like to support the development of the Ad fund to get in touch”. The Peas Please initiative is led by the Food Foundation, WWF, Food Cardiff and Nourish Scotland. This ground-breaking campaign addresses declining levels of veg consumption and aims to bring together farmers, retailers, fast food and restaurant chains, caterers, processors, broadcasters and government departments with a common goal of making it easier for everyone to eat veg.